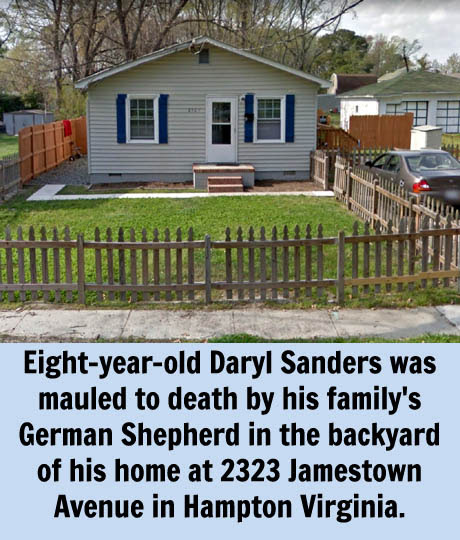 VIRGINIA -- Eight-year-old Daryl Sanders was mauled to death by his family's German shepherd, a state medical examiner in Norfolk has ruled. The Medical Examiner's Office released preliminary autopsy results to Hampton police Wednesday, said Sgt. Jeff Walden, police spokesman. "The examination showed that all injuries sustained by Sanders are consistent with that of the German shepherd, P.J.," Walden said. Officials from the forensic lab for the eastern region wouldn't comment on specifics of the examination and referred questions to Hampton police. Walden didn't provide further details, such as the number of wounds, their location on the boy's body or which ones likely caused Daryl's death. He said the department had concluded its investigation now that detectives knew the boy died as a result of the dog attack. "The medical examiner ruled the official cause of death as mauling by dog," Walden said. Because Daryl never showed up for school Friday, police think that the attack happened that morning. Daryl Sanders was a second-grader at Tarrant Elementary School. Two siblings found P.J. standing over Daryl's body shortly after they returned home from school, police said. Police, paramedics and animal-control officers found the dog chained in the back yard about 30 feet from the family's home. One animal-control officer described the dog's behavior as "docile and calm - not what you'd expect from a dog that just killed someone." Eugene Falls, director of the Peninsula Society for the Prevention of Cruelty to Animals in Newport News, said officers picked up P.J. three times last year for running loose. Two other boys alleged that the same dog attacked them in a Newport News schoolyard in September 1998. VIRGINIA -- There were moments when young Steve Fitchett wondered whether he would escape the German shepherd's jaws. It seemed like the harder he kicked, the deeper the dog's teeth sank into his flesh. Three days after 8-year-old Daryl Sanders was found mauled to death behind his home on Jamestown Avenue, Steve recounted his battle with the same dog in a Newport News neighborhood. One day in September 1998, Steve, then 10, and five friends were strolling across the playground at Washington Middle School. Steve and the others thought the dog, P.J., was chained under the neighbor's porch - until he started chasing them. Steve ran to the monkey bars. The German shepherd caught his left leg before he could climb the first beam. "He was yanking at my leg," the boy said. Steve needed 14 stitches after the attack. He has four scars on his left leg, one on his back and one on his left side. When he learned about Daryl's death from a dog attack, Steve sobbed. Linda Fitchett blames the dog's owner, Annette Sanders, for her son's injuries; a few months later she filed a civil claim in Newport News court against the woman, seeking $3,000. The Fitchetts have not received a dime from their former neighbor, who was evicted from 1213 36th Street a few weeks after the attack. "She signed a year's lease. I think I had to evict her about the third month for non-payment of rent," Ernest Carter, the landlord, said Monday. Carter's lease did not allow pets. P.J. is no stranger at the SPCA shelter in Newport News, where the dog has been quarantined since two of Daryl's sisters found the boy's body after school Friday. Animal control officers answered three complaints last year from residents in the 1100 block of 27th Street in Newport News, where Annette Sanders' mother lived. In each case, according to Peninsula SPCA director Eugene Falls, the officers found the German shepherd running loose. An officer who handled the first complaint on Jan. 16, 1999, cited the owner for not having a city dog license and impounded the dog. SPCA records showed that Annette Sanders on two occasions reclaimed the dog from the SPCA after 10 days, and paid a $75 pound fee. On the other occasion, Falls said, she picked up the dog after four days. Falls described the German shepherd's demeanor as "unpredictable." "I think he has a mental problem because of his weird temperament. When one person walks by his cage the dog is fine. The next person the dog tries to eat up," Falls said. A 3-year-old German shepherd should weigh around 80 pounds, Falls said. "This one is about 20 below that." He said the dog would be destroyed today and the remains delivered to the state medical examiner's office in Norfolk. A medical examiner will compare Daryl's wounds with teeth impressions from the dog. Hampton police have not released the results of an autopsy on Daryl, but a source close to the case said Monday the internal injuries "were serious enough to cause death." One of the wounds punctured a lung. "I checked with the people in Norfolk and Virginia Beach; this was the first known fatal dog attack in at least 30 years," said Falls, who has been director of the Peninsula SPCA for 27 years. Nationally, the SPCA last year documented 12 fatal dog attacks out of 4 million cases. "Probably 80 percent of the dog bites are not documented," Falls said. VIRGINIA -- An 8-year-old boy was killed in a savage attack by the family dog Friday. After the attack, the dog - a German shepherd named "P.J." - stood over the body of Daryl Sanders, snarling at several siblings as they pleaded for their brother to wake up. 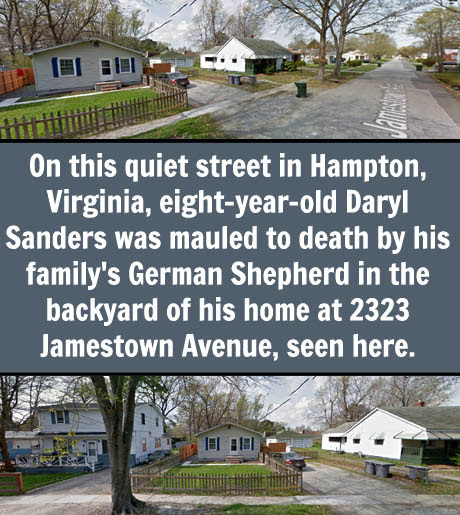 Sanders lived with his mother and sisters in a brown duplex at 2323 Jamestown Avenue in Hampton, Virginia. Sgt. Jeff Walden, a Hampton police spokesman, said one of the victim's sisters told a 911 operator at 3:43 p.m. that she found her brother dead in the back yard. Richard Clark, a Hampton physician who examined the body, said he found multiple wounds "all over the body." He guessed the boy had been dead several hours. An autopsy will determine more precisely when the attack occurred and the cause of death. Louis I. Hicks lives two doors from the Sanders. Hicks, a welder, was returning home from work when he heard two girls trying to rouse a young boy on the damp, cold ground. Hicks said one of the girls appeared to be about 10 years old. "She was calling, 'D, get up! D, get up! Get up!' " the neighbor said. "D" was Daryl's nickname. Hicks glanced across the wire fence from his porch and saw the boy on the ground, and a growling German shepherd standing over the body. Hicks said the girls appeared terrified. Hicks recognized the dog as belonging to the boy's family. As Hicks crossed into the yard, he saw a neighbor on the opposite side moving toward the dog. "He was holding a tree limb and was hitting the dog across the back with it," Hicks said. Hicks said he waited for the dog to move, then raced to the spot and lifted the body. Hicks said he could see teeth marks in the boy's neck, rip marks on the back of his shirt and noticed a shoe was missing. His wife, Sharon Hicks, said minutes later the boy's mother pulled her car into the driveway. She said the mother picked up the boy and cradled him in her arms. After police and emergency workers gathered at the scene, the mother - Annette Sanders (Annette Brown Sanders) - stood on her front porch. Sanders raised three fingers when asked the age of the dog. She also gave its name: "P.J." After the body was taken away, two officers from the Society for the Prevention of Cruelty to Animals snared the dog and locked it in the back of a vehicle. "He was calm, not aggressive at all," said SPCA officer Ron Chavers. The German shepherd will be quarantined, Chavers said, "until the court decides his fate." Police believe the boy might have been attacked shortly after he left his house to board a school bus for Tarrant Elementary School off Aberdeen Road. It was not immediately known why the boy's body was not discovered earlier in the day. "The little boy must have gone out to feed the dog or play with him before school," Louis Hicks said.